Today demand unpredictability is a given. Chaos, the new normal. Whether it’s trade tariffs hitting you with new costs, natural disasters halting operations or critical events impacting suppliers, supply chain professionals must embrace the reality of the unexpected. In this article, I will explore how additive manufacturing (otherwise known as 3D printing) can help you mitigate supply chain risk. I will also address the risks that are inherent to additive manufacturing, and how working with a digital supply platform can help you address them. Imagine this scenario. Disaster strikes and a crucial part for your manufacturing equipment is damaged. Your supplier has gone bust. Your engineering team scrambles to find a solution by re-designing the part to produce it with traditional machining. But by the time they have a working replacement, weeks have past and you’ve lost millions. As Gartner’s Pete Basiliere writes, this scenario is far from being uncommon. Things could have gone much differently for your company if you had considered embedding industrial 3D printing as a means of production that could be used in this situation. At DiManEx, we help companies embed 3D printing into their supply chain workflow. Managing risks is a crucial part of that process. How do we go about that? Typically, clients who approach us have already identified a risk area, such as long lead times for spare parts or lack of supply altogether. Using analytics, we help them assess whether 3D printing makes sense from a Total Cost of Supply perspective. If it does, we help them create a digital library of parts, and enable them to place orders on demand at the nearest manufacturing facility within our global supply platform. This digital parts library or virtual inventory can be incredibly valuable when the unexpected occurs and critical components are at risk. In most cases, parts produced through our platform are delivered within 1-2 days, faster than they would when produced with traditional means. In cases where parts have to be re-engineered, we’ve seen Total Cost of Supply drop by 600% and significant efficiency gains in manufacturing operations due to weight improvements. With more materials becoming available, the breadth of possibility is also increasing, making 3D printing a viable alternative to produce all kinds of components that are prone to supply issues. There’s never been a better moment to consider embedding 3D printing into your supply chain, and incorporating it into your risk mitigation strategy. Now, you’re probably wondering if embedding 3D printing in your supply chain is a risky process in itself. Most of these risks can be mitigated by working with a global and distributed provider, instead of taking on a large CAPEX investment in equipment – which may end up underutilized – and hiring people with specialized skills. How? A platform for distributed digital manufacturing can link your supply chain to multiple supply sources in different parts of the world. Production can be routed globally to manufacturing facilities that are best poised to deliver the 3D printed product or part whenever your company needs it. Has a disruption impacted a specific provider? No problem. The order can be routed somewhere else. You can work with providers that comply with industry standards and can help you solidify your internal processes to facilitate 3D printing as part of your workflow. Working with a supply platform reduces or removes the need to hire people with specialized skills (which are often hard to come by), as you’ll be able to use the external service on demand, when you need to. Regardless, it’s important to develop training programs for your existing employees, so they understand the implications and possibilities offered by such a service, and how their roles or responsibilities could potentially shift. Scalability issues are also less relevant when you work with a platform that puts a network of suppliers at your fingertips. Once your (part) designs are digitized, placing recurring orders and scaling up your 3D printing operation can be done within a few clicks. 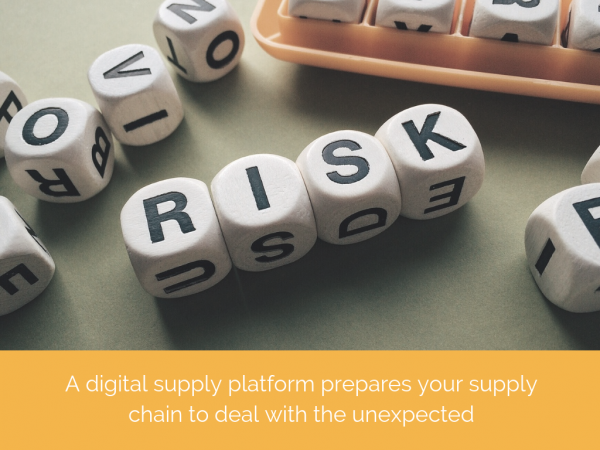 A digital supply platform can help you mitigate supply chain risk and adequately address risks associated with 3D printing adoption in a more streamlined and cost-effective way. To maximize success, supply chain leaders should consider working with such a platform, and buttressing this effort with a solid governance and change management process. If you’d like to explore how additive manufacturing can help you prepare your supply chain for the unexpected, please let me know.